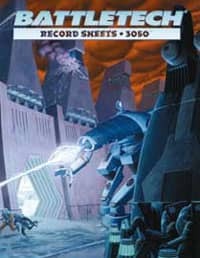 These all-new books provide pre-generated BattleTech record sheets for the BattleMechs and vehicles described in Technical Readouts 3025, 3026, 3050, 3055 and 3058, including known variants and alternate configurations. The redesigned record sheets provide game information for each BattleMech's full complement of weapons and equipment, printed right on the sheet for easy reference. Perforated for convenience, the BattleTech record sheets fit both 2- and 3-ringbinders.